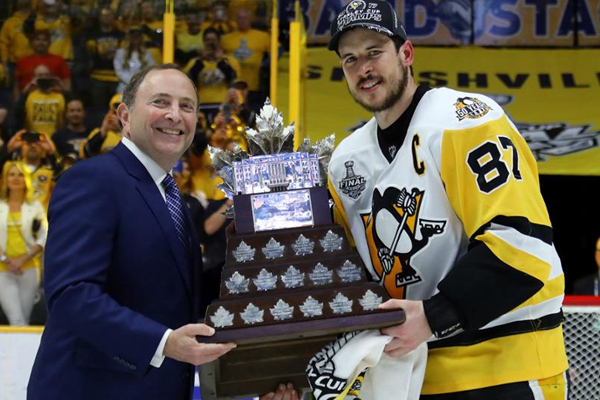 Once again Sidney Crosby was named the most valuable player of the playoffs. The Pittsburgh Penguins captain finished the postseason with eight goals and 19 assists in 25 games. Crosby has become the third player to win back-to-back Conn Smythes, he won the award a year ago when his team defeated the San Jose Sharks to win the Stanley Cup. The other two players to have earned that honour two consecutive years were goaltender Bernie Parent of the Philadelphia Flyers in 1974 and 1975 and Mario Lemieux in 1991 and 1992. “There’s so many guys who could have easily won that, and I think we just had a group of guys that understood big moments and knew how to find ways to win,” said Crosby. When asked who he would have voted for, Crosby listed a group of teammates he believed were worthy of the award. “I think [Evgeni Malkin] comes to mind right away,” said Crosby. “If you could somehow put our two goaltenders on there — you know, there were games that they stole for us throughout the playoffs. Last night the Pittsburgh Penguins defeated the Nashville Predators to capture their fifth championship in franchise history.